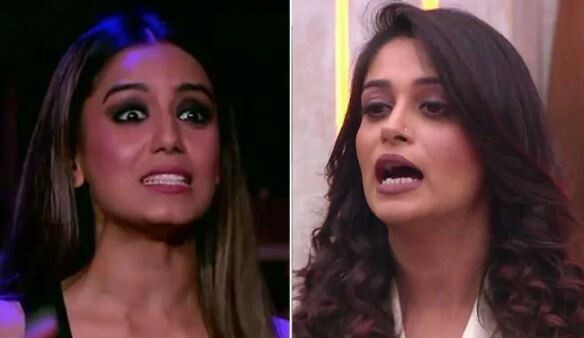 After a task where Srishty Rode and Romil joke about 'Saiyyan' and 'Bhaiyaa'; Dipika Kakkar loses her cool on brings the house down with her anger. 10.00: Dipika starts shouting and loses it on both of them. 09.55: Srishty tries to apologise to Dipika but she refuses to budge. Dipika loses her cool on Srishty and Romil saying that they shouldn't have made any comments on her personal life and on her husband. 09.45: Romil says that he has a feeling that Jasleen would get evicted. Salman agrees with him and says that she indeed has been evicted. But again calls everyone inside and says that Srishty has been evicted. But, again says that since Shivashish had been evicted the previous day no one would get evicted tonight. 09.37: Somi says that she only loves one person and that is Salman Khan. Srishty and Jasleen are sent to the sultaani akhaada. Srishty wins the first round of verbal dangal. Jasleen wins the second round. With this Jasleen emerges winner of the sultani akhaada. 09.34: Salman praises Somi and Saba and says they would see much greater heights as they have a lot of potential. Salman tells Somi about his conversation with the family. Saba leaves and audio message for the housemates. Somi's family sends some sweets and pagdi for Deepak. 09.29: After the task, an argument ensues between Sreesanth and Srishty. Somi's family comes on skype to talk to Salman Khan. Talking about Deepak and Somi, her mother says that its good entertainment to see them together with their nok-jhok. Saba says that ever since they joined the show, their relatives who had left them long back have started talking to them. 09.25: Dipika loses her cool on Romil and Srishty. She is seen talking to Sreesanth that she wouldn't accept anything against her husband. Salman enters the show again through TV. Housemates now have to fill blank spaces. The question is, "Itna hi ... thha to ... is ghar mein aaye hi kyun?" 09.22: For 'lust' Karanvir gets nominated at first but housemates change the name to Rohit. 'Arrogance' is the next dosh for which Jasleen gets nominated. 'Jealousy' is the next dosh for which housemates nominate Jasleen again. With this Farah exits the home. 09.17: Next is 'anger' which housemates dedicate to Sreesanth. Housemates are given a turn to say things to Sreesanth while he has to stay quiet. Farah gives Sree a piece of advise and asks him to be a sportsperson. Next is 'gluttony' for which Jasleen gets nominated. For 'greed' housemates nominate Deepak. 09.14: Romil and Srishty receive a warm applause from everyone. Farah praises Srishty and Romil for the entertaining play. Now contestants have to choose one 'dosh' and assign it to one contestant every time. When it comes to 'lazyness', housemates nominate Romil for which he gets a punishment. 09.10: Srishty makes fun of Dipika by talking about 'Saiyyan' and 'Bhaiyaa'. Next, Srishty plays the role of Megha and leaves everyone laughing with her antics. Srishty then dons the role of Sreesanth for the play. Sreesanth gets upset with Srishty's antics. 09.06: Farah Khan enters the house to interact with the housemates. She asks Deepak and Somi to dance romantically to the tunes of 'Gerua'. Farah sends Rohit to dance with Deepak next. She calls Romil and Srishty for a talk show. Srishty plays the role of Dipika Kakkar in the play. 09.03: Farah calls Sreesanth the centre of the house as everyone revolves around him. She also makes fun of how every week he says he won't go to the jail but ends up going anyway. Farah says that she sees Deepak, Sreesanth and Dipika as finalists. 09.00: Salman welcomes Farah Khan onto the sets of Bigg Boss. Farah says that Dipika Kakkar has been playing the role of Meena Kumari on the show. She adds that Dipika supports Sreesanth, but, he never reciprocate. Farah labels Deepak as 'Kattappa' by saying that even though he is wearing a sling whenever task comes he gets aggressive and forgets about his injury. Catch all the details with our live update as the drama unfolds at 9pm.